The start of Iran’s nuclear program can arguably be pegged to December 8, 1953. It was on that date that U.S. President Dwight D. Eisenhower delivered what was later dubbed his Atoms For Peace speech to the United Nations General Assembly. 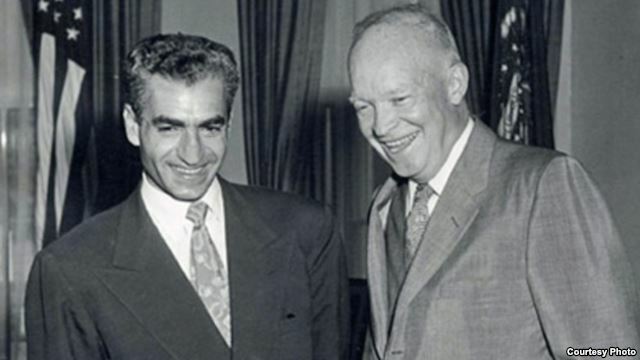 U.S. President Dwight D. Eisenhower (right) meets with Iran’s Mohammad Reza Shah Pahlavi in 1954. Under the plan, Eisenhower said the United States would provide the necessary technology and expertise to nations eager to create civilian nuclear programs. To make sure nuclear materials were not diverted to making weapons, Eisenhower proposed establishing a watchdog within the UN. That watchdog would later become the International Atomic Energy Agency (IAEA). To execute Eisenhower’s vision, Washington established the Atoms For Peace program. Under the program, the United States would provide research reactors, fuel, and scientific training to developing countries eager to harness the power of the atom. Mark Fitzpatrick, a director at London’s International Institute for Strategic Studies, says the endeavor was in part motivated by the Cold War rivalry between Moscow and Washington, as they vied to win over allies with the allure of nuclear power. “It became a key leverage point during the Cold War — each one of the superpowers sharing nuclear technology with allies to bolster their ties,” Fitzpatrick tells RFE/RL. Among the first countries to take the United States up on its offer was Iran. In 1957, Tehran and Washington signed a nuclear cooperation agreement, formally titled the Cooperation Concerning Civil Uses of Atoms. Business as well as politics drove the United States to sign the deal, according to Fitzpatrick. “Iran was eyeing a vast nuclear energy program, and presumably would have purchased much of the equipment for that program from American companies,” Fitzpatrick said. Two years later, in 1959, Iran’s Mohammad Reza Shah Pahlavi created the Tehran Nuclear Research Center (TNRC) at the University of Tehran. It was there in the Iranian capital in 1967 that the United States delivered a five-megawatt nuclear research reactor and the highly enriched uranium needed to fuel it. This nuclear reactor, in particular, and the TNRC, in general, would later reportedly be used by Tehran to carry out some of its more controversial work, including some of the country’s earliest experiments with uranium enrichment. But to prove to the world its nuclear plans were peaceful, Iran signed the Nuclear Nonproliferation Treaty (NPT) in July 1968, on the first day it was opened for signature. Tehran ratified the treaty in 1970, putting it among the first group of states to do so and on paper giving it the right to enrich uranium. Aside from technology, the Atoms For Peace program offered Iranians a chance to study in the United States. A lack of homegrown nuclear experts meant that Iran could not use the Tehran research reactor for nearly a decade. This deficit became all the more glaring after the shah announced ambitious nuclear plans in 1974, including a goal to build 23 nuclear power reactors over the following 20 years. To oversee the country’s nuclear program, the shah created the Atomic Energy Organization of Iran (AEOI). Needing nuclear experts, the AEOI in 1975 turned to the Massachusetts Institute of Technology — one of the top engineering universities in the United States — to create a special program to provide Iranian experts with scientific and technological training on nuclear energy. ​This program gave Iran its first group of professional nuclear engineers. But even as nuclear cooperation between Tehran and Washington bore fruit, the first hints of distrust were starting to emerge. Like today, Washington was concerned with Iranian plans to reprocess used — or “spent” — nuclear fuel. The separated plutonium from such a process can be used to fuel reactors, but also to make nuclear weapons. According to declassified national security documents from 1975 and 1976, Washington opposed Iranian plans to build a nuclear reprocessing facility, and the issue became a major sticking point in negotiations to sell U.S. nuclear power reactors to Iran. In fact, under the shah, Iran only signed one nuclear power plant deal with a Western partner, and it was with the Germans — Kraftwerk Union (then a Siemens subsidiary) — to build reactors at Bushehr. Was the shah bent on developing nuclear weapons According to Etemad, yes and no. Etemad said the shah indicated in the 1970s that he was open to developing a nuclear weapons program if the conditions required it. Amid suspicions and mistrust, Washington’s nuclear cooperation with Iran came to an abrupt halt in 1979, swept away not by technical disagreements but political upheaval. 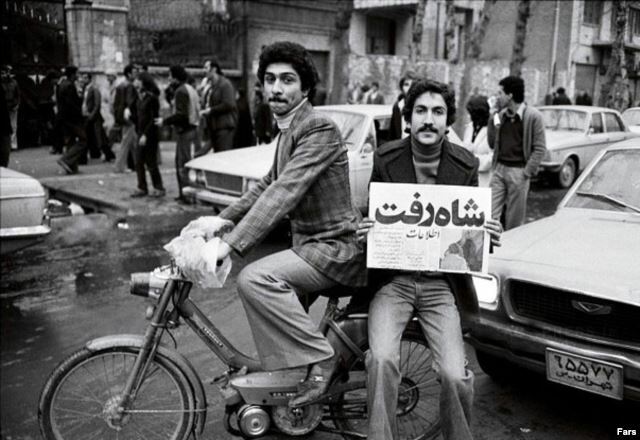 A man waves a newspaper announcing “The Shah Left” during demonstrations in Tehran in 1979. The Iranian Revolution ended the rule of the shah and with it all formal ties between Washington and Tehran, including, of course, all nuclear cooperation.